Handicrafts are all the arts and crafts that are created through the use of materials available in the environments in which the artists live. Thus they covey the cultural values, ethnic and geographic characteristics of the artist's surroundings. There are over 160 branches of Iranian handicrafts which fine woodwork is one. All these handicrafts have long histories behind them, and at times in the past made up indispensable items of the day-to-day economic, social, and cultural life of Iranians. Some, indeed, continue to be used even today but the majority are now produced and admired for their artistic beauty and value only. 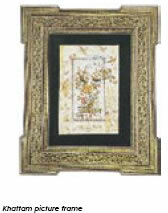 Obviously these handicrafts are categorized according to the main materials used or their major uses. Iranians have used wood objects in their daily lives and as decorative items. There were produced by artists in exquisite styles such as the moarraq (inlaid), khatam, moshabbak (latticed), monabbat (fretted) etc. High quality wood was used to make exquisite doors, windows, chairs, tables, beds, shelves for books etc for mosques, theological schools, and palaces. In making monabbat works, wood of suitable thickness is chosen and the wood is engraved according to a certain plan or, sometimes, spontaneous work is done. In one special type of monabbat woods of different types or colours are cut suitably and are glued together and then engraved. This particular type is known as monabbat-e-moarraq. Woods of walnut tree, pear tree, tanajarine tree... are carefully selected for this purpose. Fine saws, grinders, hammers etc are specially made for producing monabat works. The main centers for making monabbats are Abadeh, Golpaigan in Isfahan Province, Rasht in Gilan Province, Urumieh in West Azarbaijan, and Tehran. Moarraq is thought to have originated in India. To produce this work, woods of natural colors, and bones, shells, metals and ivory are combined. 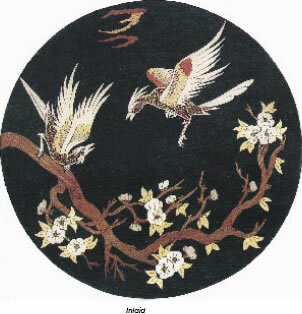 Pieces of these materials, mainly wood, are cut and pasted adjacent to each other on a flat piece of wood to create an image. In moshabbak, a design is outlined on a piece of wood of the right characteristics and then parts of the wood are engraved and parts are cut away to create a latticework. These are often put together to make up partitions to separate parts of a room, e.g. in the old days to separate the female members of the family when receiving guests. 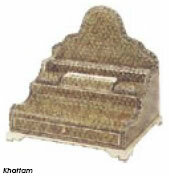 To make khatam "rods" of wood of triangular cross section are glued together. The collections of rods are then cut across to produce "layers" that can be pasted on various surfaces. In fine khatams the individual triangles are tiny but distinguishable. 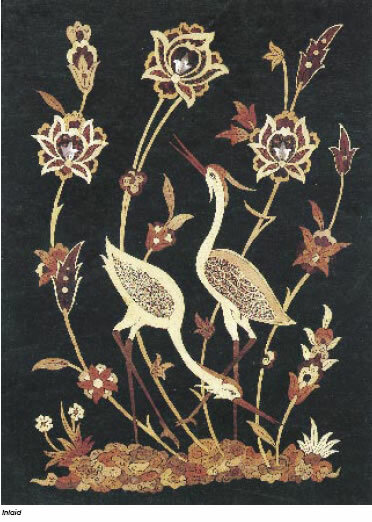 This art is 200 years old and is mainly practiced in Shiraz, Isfahan and Tehran. Today, everywhere in Iran, there are many shops that offer handicrafts, the results of the pains of many skilled hands.